City of God, with a current population of 65,000, was born in the 60’s as a “habitation solution” for the people who lived in favelas located in wealthy areas of Rio (like the “Lagoon”) and who were officially expelled to move to the periphery of the city, without services or urban infrastructure that could create any type of urbanity, with no preoccupation over the quality of life. All this, through the argument of “cleaning up” and “winning over” the spaces occupied by the favelas for the formal city, in which, regardless of some exceptions, they were open to real-estate speculation. 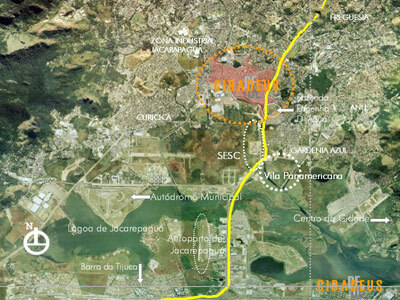 City of God is situated in an area of Rio de Janeiro in a process of enormous growth and transformation (Jacarepaguá and Barra de Tijuca), and at 1,5 km away from it, the City for the 2007 Panamerican Olympic games is being built. 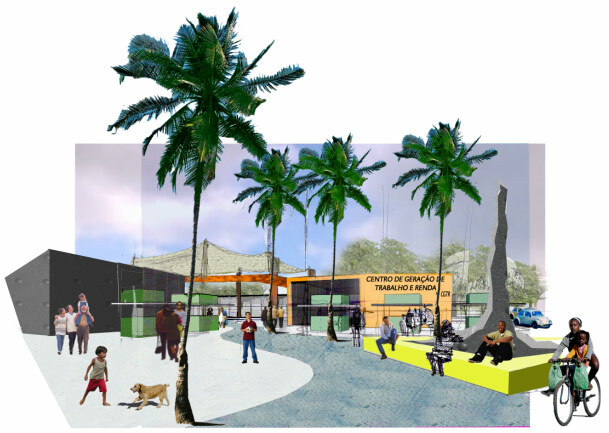 The fact that City of God relies on a strong and active communal organization, with numerous schools (elementary, since there is no middle school or school for professional education), health posts, School of Samba, etc, gives it a potential that the project we developed tries to interpret and potentialize, offering to the Communal Committee an instrument that is needed to negotiate its future. The project of Urban and Social Structuration localises, spatially, the events, reconfigures the existing centralities, and defines new programs through the dialog with the inhabitants, through the act of listening to the demands. This enables the negotiations of the Communal Committee of City of God (entity that congregates 17 local communal organizations) with the public as well as with sectors of private initiative, and with numerous organizations and institutions that act locally and in the surroundings. The project was entrusted to us by the Caixa Económica Federal, an organism that acts both locally and in the whole national scope, in all matters related to habitational programs. The elaborated study starts from the lecture of the structure of the place, from the interpretation of the demands, the incorporation of information and socio-economico-cultural projects elaborated by the members of the Committee, and it creates its integration by introducing disciplinary questions referred to the urbanistic, to the architectonic, to landscape design, to the environmental, and to the infrastructural. 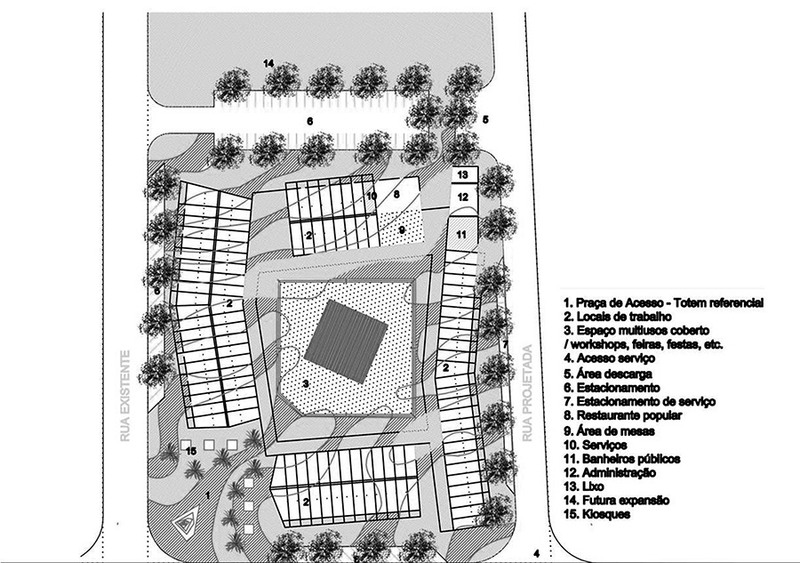 It proposes the reinforcement of the existing centralities, the creation of new poles of associative life, and the introduction of a new attractors of urban life constituted by an Olympic Complex, a Music School, and three new residential blocks, with services and commerce, for the relocation of 600 families that occupied, in very precarious situations, in the last years, a marshy contiguous sector. These new blocks are designed with a concept of urban genetic that each one of the projected expansible residential units carry. It is based on an initial nucleus of 32m2, urbanistically conceived, in which the user can realise amplifications, within the limits of his land, according to his necessities and economical capacity throughout time, amplifying one and a half times more the initial built area of their parcel. This aspect of the project is relevant as it enables the articulation of the urbanistico-architectonic conditions of general interest of the city (urban facade included) with the freedom of action of each inhabitant, without compromising the quality of the public space. The governmental agencies carry a special and specific responsibility in the area of action of the urban projects and of the habitational programs, including what is relative to public transportation, creating conditions for the emergence of projects able to change the effective paradigm, predominantly quantitative, for another who would contemplate the quality of life and the sustainability of the projects, promoting a new relation individual-society-environment. Today, it is necessary to think the development starting from the communities, and in this sense, the “social” is not a complement of the “economical”. Local development is something else; it implies the development of people as a collectivity and, at the same time, quality of life. Nowadays, the question of social development versus economical growth presents itself in the latinoamerican continent: public policies introduce this dichotomy, which has to be overcome. For that reason, it is fundamental to ponderate the capacity of the communities to re-build their future, rising from their projects, defined in a bottom-up method with the support of interdisciplinary teams, crossing and intercepting popular culture with disciplinary knowledge. The aim is to transform the territory socio-productively, envirnomentally, and urbanistically, planning its reorganization. Working with the concept of “city which integrates,” not one that cuts out and separates, with a new concept of habitat, based on sustainable urban groupments, including a complex of houses with patios, collective spaces in a controlled scale, and residential units with a certain density. In order to achieve this, we need to start by considering what exists on the site, keeping in mind its negative aspects (difficulties of access, infrastructural deficit, environmental degradation, etc. ), as well as its positive aspects (communal mobilization and participation, existence of varied programs, multiple activities, high level of organization, etc.). The idea of growth has to do with the articulation, with how the “Cities of God” are thought of as being unified, avoiding isolation, looking to “build city”, considering the quality of the environment and of the residence and services, as well as the quality of education and health. And this has to do directly with transformation, which implies thinking long-term, commencing at the presence on site, “listening” to the demands and synthesising them into consistent projects that include the generation of work and income for the inhabitants, as a central question. The land articulates itself within the physico-social fabric, in the wires and in the level at which the connection is established. It is necessary, then, to overcome the “client” policy, and that implies intermediation, looking to build networks of access, which means that it is possible to choose many paths. The network culture estimates a horizontal integration as opposed to a pyramidal evolution. The aim is to perceive the latent opportunities within the favela, creating encounter in the community itself, and the Project of Physical and Social Structuring helps in that sense. While today, it is still spoken of “urbanization of favelas” and, for example, the projects are shown, the way of presenting them itself, and the terms in which it refers to this burning problematic, show that we are very far from understanding the problem of building a city without exclusion. Mainly, considerations are still being done, for the most part concerning quantity, without referring to a concept of urbanity, which goes further than the functional and “cleansing” aspects, that, without a doubt, must also be contemplated, although without stopping there. We have to “desire more”, give ourselves more ambitious goals concerning the fashion in which we solve the problems of the “broken cities”, and to this, the architect-urbanist can bring a substantial contribution.